Cat trenchers are designed for cutting narrow straight trenches in the soil prior to laying electrical, telephone and cable lines or water and gas pipe. Trenchers are ideal for residential, commercial, agricultural, building construction, lawn care and golf course maintenance. These ground slicing implements can be attached to tool carriers such as a compact track loader or skid steer. Attachments tailor Cat machines to the specific requirements of a customer’s working needs. Cat attachments enhance the productivity and utility of Cat machines, equipping them for a wide range of tasks and operating requirements and providing total system solutions for any job application. Featuring a design with strength in mind, the trencher is ideal for jobs that require efficient and powerful digging. The TR36B, TR48B and TR60B trenchers come in 36-, 48- and 60-in. digging depths, with low- and high-flow versions. 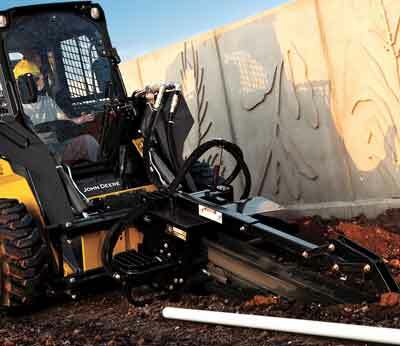 Each model allows easy entrance and exit from the skid steer or compact track loader while the spring-loaded boom reduces shocks to the hydraulic motor, machine and operator. Each trencher also features a built-in skid shoe and indicators to assist in maintaining digging control while manual side-shift conveniently allows trenching close to structures. For more customizability, optional chain-width and tooth configurations are available. New Holland Construction can meet all your attachment needs, whether it is for a skid steer loader, compact track loader or one of its other construction products. Specifically, New Holland Construction offers trenchers. Here are a few features: manual side-shift (hydraulic optional); 2-in. pitch — 50,000-lb anti-back flex chain for maximum performance and life; high torque hydraulic motor; maintenance-free sealed idler bearing; low-profile dirt shield for improved operator visibility; and much more. The trencher is available in both standard- and high-flow auxiliary hydraulic configurations. For tough conditions, a rock and frost chain 50/50 is available. For more info, visit newholland.com. Cut into the ground and create a trench through all soil conditions. 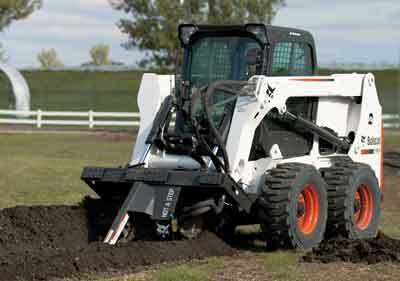 The Bobcat LT414 trencher is designed with the power and strength to dig in even the toughest, rockiest soil types. Use the hydraulic side-shift feature to dig a trench close to buildings, fences and other objects. Equip the trencher with different teeth and chain options to maximize trenching capabilities in different soil conditions. Bobcat attachments and implements help you grow your business, gain versatility, replace less-efficient machines and give you the tools to accomplish major projects. Also, rest easy with the 12-month warranty on every serial-numbered Bobcat attachment. For more info, visit bobcat.com. 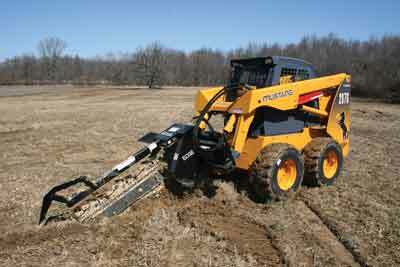 Trenchers are one of the most common attachments for a skid steer loader. Various chain types are available to suit the soil type and size of the project. Edge trenchers have a double-flighted spoil auger and excellent wear resistance on the drive sprocket. Edge trenchers operate with hydraulic flows between 10 to 40 gpm. 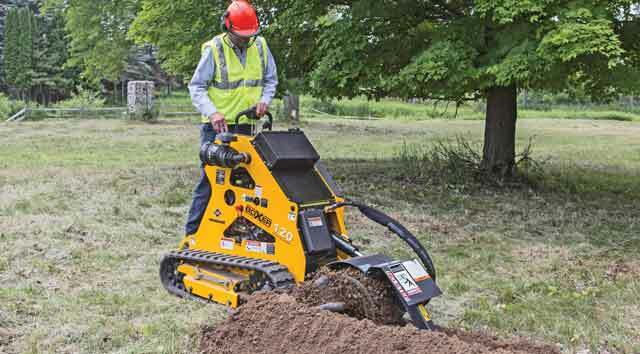 The Edge trencher is available in 24- to 60-in. digging depths and 6- to 12-in. trench widths. Manual or hydraulic side-shift Edge trenchers are able to get up close to buildings and offer single standard chains recommended for loose, damp soil or double standard chains recommended for harder, drier soil with roughly twice the number of teeth. For more info, visit edgeattach.com. 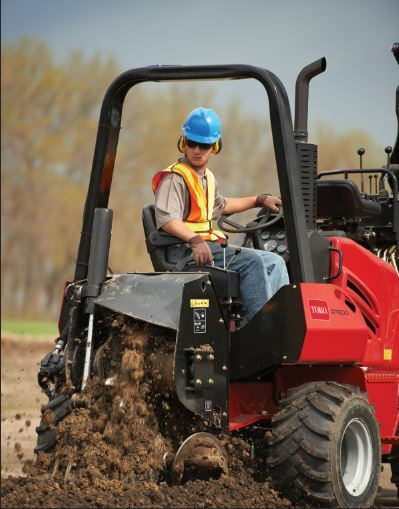 The Toro RT600 riding trencher is built to deliver smooth, consistent performance in tough digging conditions. The RT600 is the only trencher in its class that features the PowerTrench trencher drive, which incorporates a flywheel, torsion shaft and planetary gear-set design. The planetary gear-set multiplies the hydrostatic motor torque while the flywheel and torsion shaft design stores inertial energy, which is then released in tough conditions to deliver powerful and consistent trenching performance. The powerful Toro RT600 is equipped with a 65-hp Cummins B3.3 four-cylinder, liquid-cooled diesel engine. For more info, visit toro.com. The Boxer 120 trencher takes gasoline-powered compact trenching equipment to the next level, boasting up to 740 ft-lbs of torque output for ample power in the toughest digging conditions. The 120 trencher features many class-leading characteristics not found on competitive units, says Boxer. In a world of walk-behind trenchers, the 120 trencher is designed as a ride-on unit, allowing better visibility to the trencher assembly and the job being completed. The 120 trencher is the only unit in its class to feature a planetary trencher drive and a spring-loaded trencher boom and standard crumber assembly. 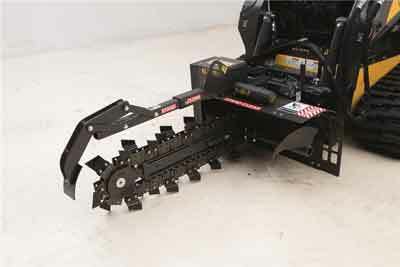 The 120 trencher is offered with a 6-in. wide combo chain and 24- or 36-in. bar options. For more info, visit boxerequipment.com. 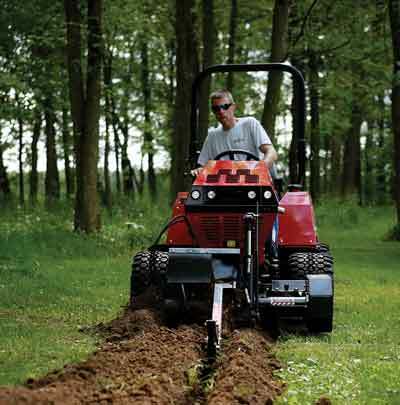 The Steiner trencher attachment helps you dig precise trenches quickly, providing a boost to your landscaping efforts. It can cut as deep as 28 in., and it features an easy-to-see depth indicator gauge, so you’re always in control right in the operator seat. Attached to the powerful and versatile Steiner 440 tractor, the Steiner trencher has a standard cutting width of 5 1/2 in. but can also dig as narrow as 4 1/4 in. Its precise width and depth make it perfect for installing lighting, irrigation, pet fences or aiding in other landscape renovation projects. And with its 550-ft-per-minute chain speed, it can power through tough terrain with ease. For more info, visit steinerturf.com. For more info on trenchers, just click this link. No trenching required!